Today I gave away my beloved bicycle, a beautiful Ross ten-speed classic, a possession that I had prized for many years. As my wife pointed out, I hadn’t ridden it in a long time so perhaps someone else could derive more pleasure from it. I tend to get sentimentally attached to “things” particularly if they’ve been associated with special people and experiences throughout my life. But after examining it closely, it was just an object, one that potentially could bring as much joy to someone else as it had to me. So I donated it to my local Community Center along with a silent wish for its new owner to ride it safely and happily. It’s now an hour hence, no pain, no regrets, no sorrow. I actually feel lighter having let go of something to which I had attached a very small but significant bit of my energy. I’ve found that letting go of emotional baggage can be even simpler if we make the decision to release it. Learning to love yourself is extremely important. Get to know yourself better and focus on your attributes. What you concentrate on is where you place your energy. Reward yourself, and as you start to feel generous towards yourself you will begin feel the same way towards others. Start slowly and build on it in the same manner you would undertake any major task. The more goodness you see in yourself the more you will recognize in others, and vice versa. Heck, you might even go out and buy yourself a new bicycle! It’s 2 o’clock on a peaceful afternoon and just when you least expect it that wave of grief overtakes you like a tsunami, knocking you down, pulling you under, and threatening to drown you in an all-consuming, nightmarish sea of feelings. Who among us hasn’t experienced that excruciating, debilitating, numbing, devastating feeling of loss? Death can sometimes brings about that sensation but sometimes a loved one’s disappearance is even harder to bear when it was their own decision to leave you. Many months and years after their departure, a simple song on the radio can reopen painful wounds. As you experience that grief surfacing, it feels as though your head is about to explode, offering brief but false promises of a sadistic conclusion to your endless tears, pain and anguish. And just when you thought you had no more tears to shed, that reverberating agony brings more to the surface. It’s enough to disabuse anyone from ever considering opening their heart to anyone again in the future. And who could blame them? How can you possibly mend a heart so shreaded? I don’t mean to trivialize the pain but the first thing to realize is that it’s only a feeling. Of course it’s a horribly real, all encompassing sensation, so we naturally try to avoid experiencing the pain. But there is something that you can do to get rid of it. I’ve found that energetically, you can’t let go of it unless you unlock it and unlocking it requires you to feel it. Throughout my life I’ve observed that when a person grieves, that grief (which is now in the form of energy) is released for a very short period of time, hovering around the person’s heart like a fog, bringing about temporary relief, only to witness that pain seeping right back into the person’s heart shortly thereafter. The reason for this phenomenon may be that we as beings would rather have our own pain than nothing at all because we fear having emptiness at our core. Over time our pain can become a familiar and acceptable alternative to the unknown. It also explains why a person can lose someone close to them, grieve for years and years and never escape the feeling—because that pain is pulled right back into the wounded heart that released it just seconds ago! I’ve developed a very simple and effective way of mending the broken heart of just about anyone who is ready to let go of their anguish. In doing so I get the person to feel, unlock and release their grief. I then grab it energetically and literally pull it out of them, replacing it with warm, loving energy. It’s something that almost anyone can learn to do. The entire process is explained in my new book, You Are The Healer: Discover Your Miraculous Potential to Heal Yourself & Others. The truth is that we never stop getting our hearts broken. This is something I’ve experienced again and again, having lost almost every significant person I’ve ever had throughout different periods of my life. These people are the most beautiful gifts that we could ever receive and sometimes it’s only when we lose them that we realize fully just how significant they were to us, and how we took them and their love for granted. When you look at it from a spiritual perspective, the physical universe is set up that way. Everything that we have, our loves, our friends, our possessions, even our own bodies, are destined to eventually be lost. As the old saying goes, “You can’t take it with you.” Or can you? Let’s look at it from another perspective: Hearts break open, not closed. And once we are able to let go of the pain and grief, we realize that our hearts have become larger and more able to hold love, thus we experience love on a much deeper and more fulfilling level. We then discover that we have more love to give. You can’t appreciate love without loss and the amount of love you hold is directly proportionate to the joy and happiness that person brought into your life and allowed you to feel—the lack of which is felt as loss. It’s an empty container created by the marvelous substance it once held. That container however, can again be filled. As spirits we’re all connected and you can’t lose a connection to someone you love, even if that person dies. They’ve just lost their body but the immortal spirit, which animated it and gave it its personality, still exists. Letting go of the pain unclogs the communication lines between us and our loved ones, enabling us to send them thoughts, to receive thoughts and maybe even feel their presence every once in a while when they come for a visit. It’s my own reality that once our short lives are over and we go back home to the “other side” we realize that we haven’t really lost anything. Our friends and loved ones are all there but we now have much stronger bonds with those whom we thought we’d lost forever—bonds forged through pain. Even our possessions can be materialized there if we desire, so nothing is ever really lost forever. Treasure every person who comes into your life as the unique gift that they are. They are here to teach you something and you are here to do likewise. Never miss an opportunity to tell your loved ones that you love them. Let go and allow them to enter and leave your life as their own destiny dictates. You can always send them your love, which is as real a substance as anything physical, only more so. It’s that care package that will always arrive and be appreciated on a higher level. It will maintain your connection to them. Love is who and what we are and is what connects us. It’s really all there is. God is love, and so are you! As I’m preparing to write this, Stevie Wonder’s My Cherie Amour is melodiously wafting into my office from an upstairs room. Effortlessly conveying tender sentiments and a recurring recognition of how music can transport us back to a special place and time, instantly reliving feelings that seemed unreachable just moments before. Can you remember a time in your life when you felt a close, moving bond with someone and an appropriate tune seemed to celebrate that event? Perhaps it was holding your newborn child for the first time, getting that new puppy or feeling extreme affinity and admiration for someone close to you—wanting only for their happiness. What melody was playing at the time of your most uplifting event? Play that tune in your head now and notice the warm feelings surfacing. This is the feeling that I want you to focus on as you’re reading this article. It’s about love. Not just your everyday garden variety of love, but real love, the kind we’re all made of deep inside, the unconditional kind. The love I’m referring to is so precious a substance that when given as a gift it will certainly last an eternity. In a sense, it’s that piece of God inside each of us which allows us to connect with another on a very deep, personal and spiritual level, and once infused, it’s possibly the only worthwhile quality that we take with us when we leave this planet. I’m convinced this substance can heal. I am an energy healer and I use that love to heal others. There are lots of us out there, each performing our own personal brand of “magic” in many modalities and in so many varied ways. We differ in technique, experience and capability, by the types of issues that we resolve and by the fees that we charge. Sometimes the appearance of this special ability displayed in others is enough to convince anyone that they are incapable of ever performing it themselves. I would like to de-mystify that “magic” for you if I may. It all starts with energy. Energy is life. It’s that special substance or quality which animates otherwise inanimate objects. It’s the essence that lifts our spirits, gives our bodies movement and expression. It’s what makes us look radiant and feel happy. It flows through and influences every part of our lives, from the way we feel to the way we think. Basically everything is energy—your body, emotions, thoughts, food, the air, sound, colors and even your spirit! Over the years I’ve learned how to utilize energy to heal others, both in person and at a distance. And I can tell you that when it comes to performing real miracles on a daily basis, you are far more capable then you ever dreamed possible and it’s just your own belief that you can’t which is stopping you. Here’s a simple way to begin: Focus on loving thoughts deep inside of yourself. Use the memories of your most heartfelt experiences to get your energy rising. Take in a deep breath. Realize that air is energy and by breathing in you are accepting life. By filling your belly full of air (not just the chest) and holding it for a moment, you can’t help but feel relaxed and energized as you exhale. Breathe in and out a few more times, gradually feeling yourself pulling energy up through your body from the earth. Focus on those loving thoughts inside your heart and send that warm, pure, kind energy out to someone near you, simply by using your intentions while letting go of any expectations. Intentions effortlessly move energy and they are probably the most important, yet most underrated, of all abilities that we possess as sentient beings. As you feel the love go out to that person, watch the expression on their face change as he or she is receiving the beautiful product of your caring. You don’t have to tell the person what you’ve just done—it’s more fun to do it anonymously! Smile to yourself as you see its effect—and know deep inside that you played a special part in it. As you expand this practice you will find yourself absorbing energy from other sources. I have many friends “upstairs” who I call upon for energy and they always seem to respond more abundantly if I first send them some of that love. The more I work with love the more I realize how the devastating result of its absence affects everything around us. Most people have so little love in their lives that when you send it out—unconditionally and altruistically—marvelous shifts in that person’s character and behavior can sometimes be observed. Negative emotions such as fear, anger and feelings of loss can be lifted. The resulting relief may spark a realization about life and their purpose for being in it. In the distance The Rolling Stones are now playing You Can’t Always Get What You Want. “But if you try sometimes you just might find, you get what you need.” Realize that the more you give to others the more you will get—not necessarily from the person you’re sending that love to—but everything you transmit to others (positive and negative) eventually comes back to you. Energy works that way! Accept those who come into your life without judging, recognizing them for the unique gift that they are—while loving yourself as well. Touch them with your heart and know that in your own way you can truly change the world—and the way you view every part of life along with it. Some time ago I was giving demonstrations of my healing work at an old age home. One of the people whom I had the good fortune to work on was an elderly retired doctor. He had only been there for two weeks but was already starting to feel the bleak isolation of his situation. He was fascinated with the energy I was sending him through my hands and with all the technical information that I was disseminating. After I was finished working on him he remarked how important touch is. He pointed to a lady sitting by herself across the way and remarked; "Two days ago I sat next to her, started a conversation and after a while I asked her if I could hold her hand. She said yes, and in a few minutes she started to cry." When he asked her why she was crying she said, "No one has touched me in over six months." On a physical level, touch (which can be thought of as a way of conveying love) is something that we all need. Babies in hospitals and people in old age homes alike die from the lack of it. Touch can bring about healing on many levels and it’s interesting to note that when we say something is "touching" we’re usually referring to a feeling being experienced on an emotional or spiritual level. We’re also commenting on how this experience is affecting our own energy. Unless they’ve been physically, emotionally, or sexually abused, people usually like to be touched. The single most basic instinct a person has when receiving an injury is to put their hand on the place where there’s pain. When a child falls and hurts her knee, her mother or father will invariably put a hand there and might even kiss it to make it feel better. This feeling of love is something we all want—to be nurtured and cared for. On an emotional level, touch can be the vehicle which releases the fear that lies beneath the sadness, emptiness and turmoil. I’m sure you’ve heard it said many times that there are only two emotions, love and fear. All other feelings and emotions fall under one of those two categories. Hatred, jealousy, anxiety, criticism, insecurity, worry, and anger are all driven by fear. Fear has been a controlling factor since the dawn of time. Governments have maliciously used it to achieve their ends. For example, Hermann Goering, Hitler’s designated successor, was quoted in Nuremberg Diary as having said, “Voice or no voice, the people can always be brought to the bidding of the leaders. All you have to do is tell them they are being attacked and denounce the pacifists for lack of patriotism and exposing the country to danger. It works the same in any country.” Sound familiar? This fear takes many other forms and pervades every part of our existence, forcing us to focus our thoughts on basic survival, even in times of abundance, distracting us from our true life’s purpose. Compassion and a yearning for peace for example, is a product of love. Fear cannot exist in the presence of love, just as darkness cannot exist in the presence of light. So when you tap into your limitless reservoir of caring and compassion you are allowing your love to transform that fear. The more of this love you give to others, the greater your capacity to hold it becomes. Once you learn to overcome your fear of losing it and send it out unconditionally, even to those people whom you may not like very much, you become larger and more secure as a being. There is no limit to how many people you can love, on many levels, or how much love you can hold as a result. The more love you give, the more you will get. Dispensing unconditional love places you on a spiritual path and there is no easier way to find your “soul-mates” than by being on a spiritual path. A select few of these special beings whom you meet along the way may remain in your life for the duration and beyond, sometimes as close friends, and in some cases as extraordinary spiritual partners, who will share your life, nurture and honor you as you do them. Each of us has the ability to touch the lives of others in our own unique and remarkable way, the depth and breadth of which is orchestrated by our intentions, imaginations, creativity, knowledge, wisdom, compassion, intensity of feeling and the skill of knowing when and how to deliver that love. In doing so we may recapture glimpses of our true purpose for being here. 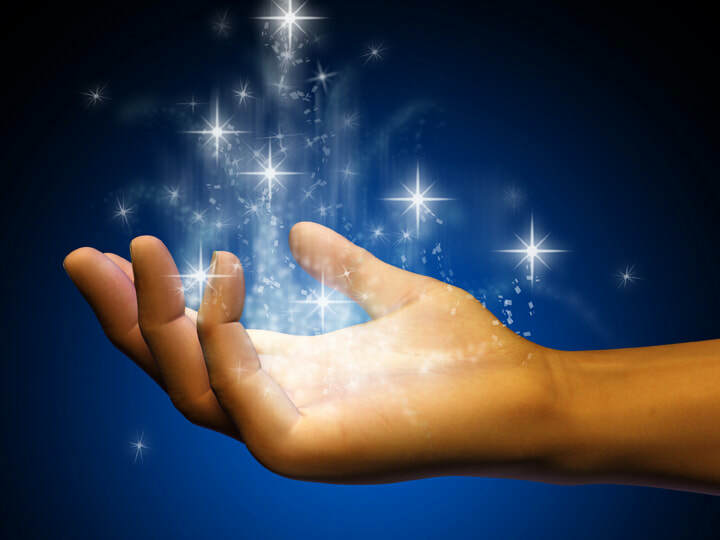 Energy Healing is a perfect way to fulfill that destiny and contrary to what some would have you believe, you don’t need a special gift to be a healer. All you need is love. Barbara DeGraw: For those readers who may not know who you are, who are you? Reiki-Master, keynote speaker and now an author. I'm also an empath and have been doing distance healing since I was a child. Formerly on staff at Northern Westchester Hospitals Center for Health & Healing, I now have a healing practice based in Westchester, NY and collaborate with therapists, hospitals, MDs and other health care professionals on a wide range of clients and conditions. My energy healing workshops are being given in many large corporations, continuing education programs, non-profit organizations, colleges and holistic centers throughout the Northeast. BD: Why did you write, "You are the Healer?" GK: To empower the reader and expel the myth that you have to be born with some special talent in order to be a healer. We're ALL uniquely special! I believe that each of us is a potential healer, capable of performing real miracles on a daily basis and the only thing stopping us, is our own belief that we can’t! I’m convinced that I can take almost anyone and teach them to heal others and have been doing just that for many years through my workshops. The only requirements necessary are for the person to be willing to re-connect with the unconditional love inside of them, that God-like quality which is their true essence and have a sincere desire to share that love with others. Once you re-discover it, nothing in your life will ever be the same again! My book is an outgrowth of my workshops and personal discoveries in this field. I also wanted to write in a manner that would be easy enough for a beginner to comprehend and apply yet significant enough to impress nearly any master healer. BD: There are tools in this book to heal ourselves and to heal others; is it more important to heal others or ourselves? GK: With energy healing you are actually healing yourself as you heal someone else. From a spiritual perspective any benefit you impart to others will always come back to you in some form. From another perspective, the energy which you pull from other sources has to flow through you in order to get to the person you’re working on. As a result, you get to keep a small part of that energy. Think of it as an energy toll which recharges you as well. As spirits we are all intimately connected, so any kindness you show to others you are also giving to yourself. BD: If we are not healed, can we heal others? GK: Certainly! We're all broken but we sometimes find ourselves doing those things for others that we most need to do for ourselves. Caregivers are prime examples. Bad experiences from the past when overcome can become our greatest attributes giving us huge insights into ourselves and others. As a healer your unique life experiences can become your most important credentials. BD: What is true healing? And how do we know that "it" is healed? GK: Love is who and what we are. To impart that life force to another unconditionally is the greatest gift that you can give to someone. As with all gifts, however, it is up to the receiver to determine if they want to accept it and how they would like to utilize it. A healer should never measure his or her successes by the outcome of the healing session. Many factors play into the outcome, most of which are above our awareness and beyond our control. Just because there is a piece of God inside of each of us doesn't give us the right to play God. As a healer, know that by just showing up and being there unconditionally for your client, listening patiently, letting them know that you understand and accept them without judgement, you are doing 90% of your job. BD: How do we discern from temporary relief from the symptoms and a real healing? GK: Awareness. Physical symptoms are often held in place by emotional trauma. I can clear out emotional trauma from a client and as a result bring about major relief in their physical body only to have them go back to the source of that emotional trauma, pick up new trauma and in doing so they might think that the healing didn't really work. An example of this is a woman who came to me having been repeatedly beaten up by her boyfriend. I energetically cleared her out, got her feeling good about herself and when she returned home was again beaten up. Did that make the healing a failure? Each time a person comes for a healing, they become stronger, moreself-determined and love themselves more. Some people need more healings than others. The fact is you can't really love someone else until you first love yourself and refusal to accept abuse is indicative of that self-love. BD: What is the one most important key to healing? GK: Love! It's our true essence as beings. It's the only gift you can givethat will last an eternity and the only substance of any value which we takewith us when we leave this planet. BD: Let’s say someone gets a growth on their skin; a tumor. The doctor is not sure whether it is benign or malignant, it needs a biopsy. Before the biopsy, does the person have a chance to heal this and release it from their body? How? GK: Yes! I've had several cases where people have come to me having been diagnosed with possible breast or other cancers and we've been able to shrink or eliminate the tumor before the biopsy. It doesn't happen with every case, but even in those where the outcome was as predicted I've been able to get my clients emotionally ready to attack the problem and go through the treatment, eventually eliminating the problem. How? Form follows energy. In other words, your physical body takes cues from the energy field surrounding it constantly giving it signals, telling your cells when to divide, telling your endocrine glands when to secrete, and lots more. If that field is broken or blocked it can actually be giving the wrong signals to the body, so when you clear out those blocks, the body actually heals itself naturally, the way it was intended to work. BD: Is this a sort of invitation? A fork in the road to heal the underlying issue or to move into physical illness? GK: The body is a tremendous metaphor giving us indications as to the emotional causes of our physical problems. Since we have layers of energy fields surrounding us, unresolved issues will usually clog them first before the problem shows up in the body. You can certainly look at an illness as an invitation to view the underlying issues. All things happen for a reason and in hindsight my clients almost always see the benefits from their past suffering. BD: What is the goal with healing? Do we ever becoming fully healed? GK: We are always growing. With growth comes awareness and as we become more aware of ourselves as spiritual beings living in bodies we find there is always some aspect of ourselves upon which we can improve. Energy healing touches every aspect. As we probably can only comprehend the level which we are on, our fullest potential lies beyond our comprehension. BD: One of the exercises you have for developing your intuition is the one on page 62 with the quarter. In this example it is to decide whether to move or not. You say that if you get an answer "yes" and a short time later you begin to feel bad about, that that is your intuition telling you not to move. Could that bad feeling be just fear? If the person is clear about moving in the first place, they wouldn’t need to flip a quarter. Is fear what stops us from listening to our intuition in the first place? How do we discern from fear telling us not to move and our real intuition telling us not to move? GK: You are right that fear is what keeps us from listening to our intuition. Fear manifests itself in many forms. There is the fear of success for instance. However as you know there are basically only two emotions, fear and love. Since fear can't exist in the presence of love, whenever a question such as this holds me in suspense I ask myself, "What would love do?" When love is present the environment becomes safe and that safety allows one's intuition to prevail. Intuition feels right and contains a knowingness, fear doesn't. BD: Is this book for people who want to become healers or can everyone use it? GK: This book is for anyone looking for something to help awaken their own spirituality as well as those who want to become professional healers and everyone in between. Everyone can benefit by learning to move energy and the beauty of it is that anyone can utilize it in almost any setting. BD: What is one thing you would like to share with our readers? GK: Live each day as though it is your last and treat each person in your life as the unique gift that they are. They're there to teach you something. Feel the love inside and never miss an opportunity to tell those special beings how much you love them. There's a saying among healers that you can't heal someone you don't love, which I believe is true. Make it your goal to find some aspect to love in each person you meet. Remember that YOU ARE THE HEALER, and the world is a better place because of you. Although I had never thought of myself as one, I’ve been a healer for most of my life, doing “distance healings” anonymously. Sometimes achieving miraculous, sometimes subtle and occasionally getting no results at all. Since I’m an empath, I’ve almost always been able to feel what other people are feeling—especially when it comes to painful emotions, probably because these are the feelings that we tend to broadcast the loudest. I eventually developed the ability to extract those feelings of pain, fear, anger and other negative emotions from people around me. I think this ability (some might call it a curse) started as a result of witnessing my parents screaming at each other as a young child lying in my crib, and in some way feeling responsible for their strife. They had a good marriage, but when you see two people whom you love and depend upon completely at each other’s throats, it’s enough to terrify any child, especially a very sensitive one. I would just feel their hostile emotions and absorb all those feelings into myself, which would de-fuse the situation and they’d stop fighting. Like magic! I now realize that this survival mechanism might have set the stage for me to unwittingly use this method of “control” in many future situations as I grew older resulting in temporary detriments to my own health. I would often absorb emotions resulting from the conflicts of friends and I’m sure it kept me from getting beaten up as a kid by some neighborhood bullies. I’d simply send them kind and gentle energy as I pulled in their anger (aimed at me, but as I realized, not having to do with me) and they’d leave me alone. In fact as time went on, the calming effects of my presence was so greatly valued as an adult wherever I worked, that I would frequently be brought in to diffuse tense situations between people who were about to come to blows. Some would remark “He has a unique way of smoothing things over.” What I was really doing was absorbing and rearranging their energy. I eventually discovered that at certain times, I was able to generate warm, loving feelings inside of myself, which I would send to others simply by intending to do so. And as a result, I could sometimes influence the physical and emotional states of others, in a positive way, at a distance. That’s when the real miracles started to happen. I never thought of this as a special ability. I felt it was something that anyone could do—if they cared enough, and quite honestly I was apprehensive to tell anyone else about it. After all, who would have believed it? Plus, the possibility of spending time in a rubber room wasn’t high on my list of priorities! But, over the past few years the climates have changed, the “witch hunts” have subsided, and integrative medicine has entered the mainstream. The best hospitals in many large cities, who just a few short years ago would have scoffed at the possibility, are now embracing many alternative methods of healing. I’ve studied hands-on healing with some of the best healers in the world and have developed my own proven methods of eradicating fear and fixing the “broken heart” of almost any client, usually in just one session. As a result people continue to travel from all over the world to experience a healing session with me. Every experience in life has a purpose, even though it may not be apparent at the present time. It is up to each of us to discover the reason for our present life situations and the lessons that we need to learn from each one. These realizations may also lead us to discover our true life’s purpose. Could becoming a “healer” be yours? The truth is that every one of us is a potential healer, capable of performing real miracles on a daily basis, and the only thing stopping us is our own consideration that we can’t. I’m convinced that I can take almost anyone and teach that person how to heal others—which is exactly what I’ve been doing over the past few years. The only requirement necessary is the willingness to re-discover the unconditional love deep inside—that God-like quality which is our true essence—and to have a sincere desire to share that love with others. Love is the only thing that heals and once you connect with it, nothing in your life will ever be the same again.